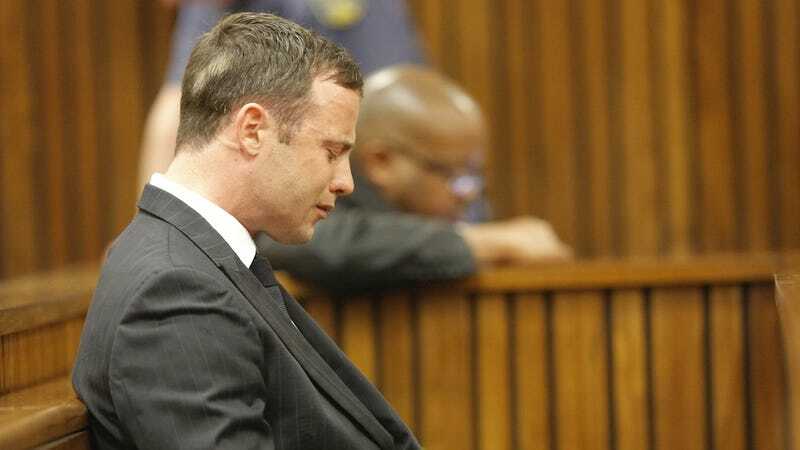 A South African judge has ruled that Oscar Pistorius did not intentionally commit premeditated murder last year when he shot his girlfriend, Reeva Steenkamp, four times through a door. But he still faces charges of "culpable homicide"—manslaughter, basically. The New York Times reports that the judge, Thokozile Matilda Masipa, wasn't persuaded by testimony of an argument the night of the shooting from neighbors, nor those disturbing texts (including the one where Steenkamp wrote that Pistorius sometimes scared her). "In my view, none of this evidence, from the state or defense, proves anything.... Normal relationships are dynamic and unpredictable sometimes." Masipa concluded that the prosecution hadn't just sewn up their arguments that Pistorius didn't believe he was hearing intruders: "The state clearly has not proved beyond reasonable doubt that the accused is guilty of premeditated murder." But she did lay into Pistorius for how he "acted too hastily" and "used excessive force," bywords for negligence that seem to suggest he won't escape the culpable homicide charge, at least. The court will reconvene tomorrow for rulings on the additional charges, which also include illegally owning a firearm and two counts of discharging a weapon in public. If found guilty, Pistorius could still do as many as 15 years in prison for the culpable homicide—though he could also do much less, as judges have broad sentencing leeway.